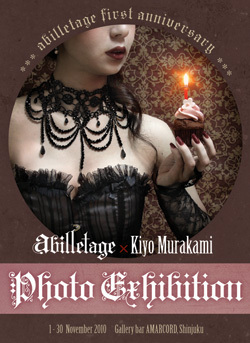 Bambi (designer of abilletage) and I held the photo exhibition at the bar AMARCORD in Shinjuku, Tokyo in November 2010.
on Nov. 27, we held the party and many people came and celebrated abilletage's first anniversary. I created some images for our exhibition and party. some creators run their booth and the dancer ALK putted on a exciting show for us. photos and reports(written in Japanese) are here.